is a freelance journalist whose work has appeared in The Guardian, Buzzfeed, Vice, CNN and openDemocracy, among others. She lives in London. Can you imagine a world without heartbreak? Not without sadness, disappointment or regret – but a world without the sinking, searing, all-consuming ache of lost love. A world without heartbreak is also a world where simple acts cannot be transformed, as if by sorcery, into moments of sublime significance. Because a world without heartbreak is a world without love – isn’t it? The Industrial Revolution changed things. New economic realities and Enlightenment values about individual happiness meant that romantic love mattered. While marriage remained – and remains – closely tied to patriarchal control, it attained a new quality. Lifelong emotional, intellectual and sexual fulfilment – and monogamy for men, not only for women – became the ideal. Ever since, this kind of relationship has been propagated by capitalist culture. There is little beside romantic love that many will pursue so doggedly, knowing it is likely to result in agony. Whether through conflict, betrayal or separation, love is almost certain to end in heartbreak. Even in ‘successful’ partnerships, someone’s going to die eventually. It’s no wonder heartbreak is readily accepted as the price of romantic love; we are socialised to believe that this kind of relationship is our raison d’être. Even if we could salvage romantic love from its worst bedfellows – for example, if we eliminated its heterosexism – the fact remains: it is likely to end in tears, even mental or physical illness. Worse still, perceptions of romantic love as overpowering mean it is used to explain violence. 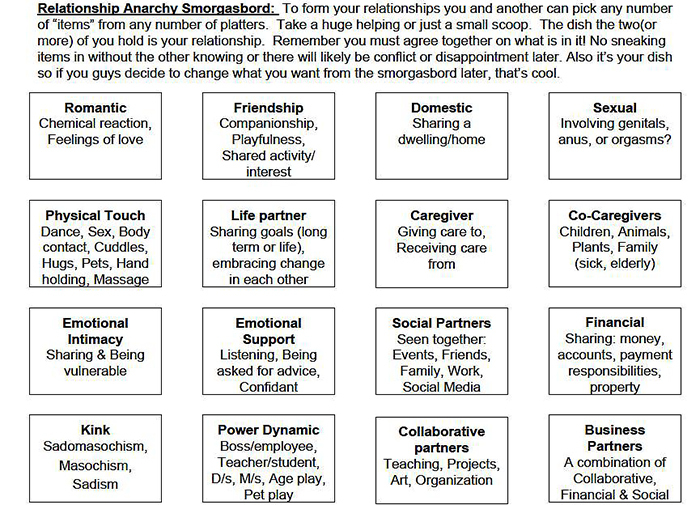 For others, engaging with relationship anarchy might mean making and remaking a life’s relationships from scratch. For instance, by freeing yourself from the notion that a romantic partnership must follow a predetermined path, and instead negotiating multiple, loving, ethically nonmonogamous relationships that might ebb and flow over time. It could mean deciding to raise children within a platonic, emotionally intimate relationship between three people, and having sexual connections outside of this – or none at all. Relationship anarchists can create a ‘love life’ that is not dependent on one romantic partner who is ‘their world’, but on a tapestry of profound connections – whether platonic, romantic or sexual. As Nordgren writes in her manifesto, ‘love is abundant’, not a ‘limited resource that can only be real if restricted to a couple’. Redistributing love does not dilute the love we feel for a particular, dear person. Indeed, building a network of intimate connections can strengthen them all – in part because it strengthens our relationship with ourselves. Relationship anarchy won’t eliminate heartbreak – but we probably wouldn’t want it to. That depth of feeling is often beautiful, and responsible for much of the arts. Like love itself, heartbreak excavates souls and decimates egos, forcing us to look at our deepest crevices and learn things we might not otherwise. In heartbreak’s seemingly merciless grip, we have a rare opportunity for rebirth. Surely, a world without heartbreak is a world without the kind of vulnerability that makes us know we’re alive. Just as surely, being conscious about how we relate to ourselves and to others – rather than automatically privileging one relationship type – can empower us to build a life so rich that we don’t feel as if we’ve lost ‘everything’ when we lose one love among many.